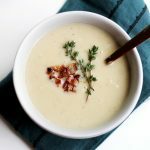 This Roasted Cauliflower Soup with Bacon from The 5-Ingredient Paleo Cookbook is creamy, rich, easy, paleo, and Whole30 compliant. Cook the bacon over medium-high heat until crisp, about 5 minutes. Drain on paper towels, chop, and set aside. Spread the cauliflower florets evenly on a parchment-lined baking sheet. Roast for 20 minutes, until crispy but not too brown. Transfer the cauliflower to a large saucepan. Over low heat, add the chicken stock, coconut cream, and garlic. Simmer for 1 hour. Season with sea salt and pepper. Garnish with fresh herbs, if you’d like. Enjoy! I tossed the cauliflower in a bit of the bacon fat before roasting. I blended 3/4 of the soup because I like my cauliflower soup creamy with a little bite, and then added the bacon.